The LEO Network is a community of local observers and topic experts who share knowledge about environmental change. 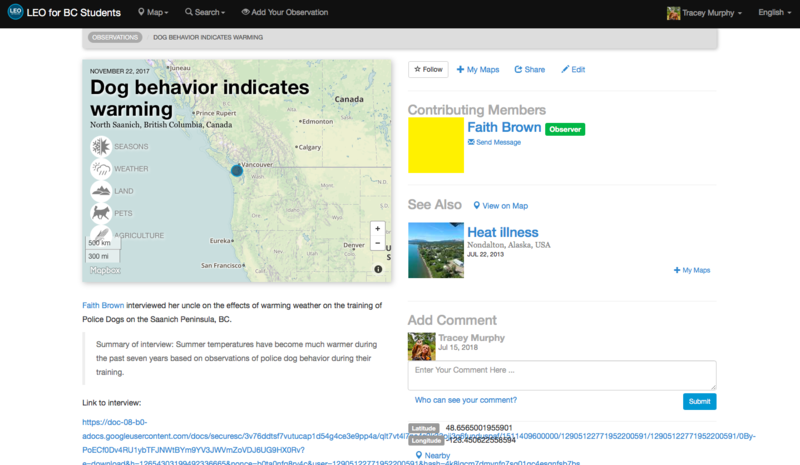 LEO enables anyone to document observations of unusual environmental and ecological change relating to and human well-being. With LEO, students connect with others in their community, share observations, raise awareness, find answers about significant environmental events, and help develop adaptation solutions. More importantly, students participate in environmental surveillance by engaging with topic experts in many different organizations and they can become part of a broader observer community. This project is a collaboration between the LEO Network and Saanich district secondary students. The LEO network is an excellent collaborative opportunity for students to learn outside of school classrooms in their communities. As LEO observers, students are exposed to scientific research and the rich possibilities of mapping as they discover patterns and trends from LEO observations. Thinking -The thinking competency encompasses the knowledge, skills and processes we associate with intellectual development. After the LEO inquiry project is completed, students have opportunities to observe the posts, identify relationships between observations, and compare their personal observations of environmental changes to that of an older generation and topic experts. Students may formulate hypotheses about why these changes are occurring and receive real-life feedback from scientists and other experts. Students have the opportunity to describe human pressures on the environment and the socio-political and cultural implications of environmental change. Students will develop, through the core competencies of the new curriculum, intellectual, personal, and social and emotional proficiencies that they need to engage in deep learning and lifelong learning. Personal and Social - Personal and social competency is the set of abilities that relate to a person’s identity in the world, both as individuals and as members of their community and society. Through their interviews with community members who have personal knowledge of environmental change, students will listen to the reflections of people who have spent time observing and interacting with their surrounding environment. Students will increase their understanding of environmental change through access and exposure to the recollections of elders of particular environments that may have changed, or through cultural stories, photographs, or other kinds of evidence. Communication -The communication competency encompasses the set of abilities that students use to impart and exchange information, experiences and ideas, to explore the world around them, and to understand and effectively engage in the use of digital media. Students will solicit stories of environmental change from community members and document them within LEO Network postings including the use of narrative writing, photographs, and even video or audio when appropriate. Tracey Murphy is currently teaching secondary students in Saanich school district 63 and is a graduate student in Educational Psychology and Leadership Studies at the University of Victoria. Her research focuses on how the Calls To Action by the Truth and Reconciliation Committee might be implemented through art curriculum from the recommendations of Indigenous artists. As a youth and child care worker with vulnerable youth for over fifteen years, Tracey has extensive experience facilitating experiential learning experiences in outdoor settings. Tracey taught scuba for over five years and learned how valuable close observations of the natural world contributed to a deeper understanding of the impacts of human impact, and encouraged divers to learn about the interactions of life and healthy ecosystems. These experiences have affirmed how curiosity, collaboration and observation are essential to analyzing environmental changes. More recently, Tracey has embraced the new Socials Studies curriculum and core competencies through cross-curricular projects like the LEO observations and posts. Dr. Tom Okey is an Adjunct Professor in the School of Environmental Studies at the University of Victoria, and Principal of Ocean Integrity Research. His work has generally focused on understanding the effects of climate change and other stressors on ecosystems and human well-being. He is the coordinator of the Local Environmental Observer (LEO) Network in British Columbia, in association with the First Nations Health Authority. He is now partnering with teachers and students in public schools to implement youth-elder approaches to understanding ecosystem change, as well as youth-based ecosystem monitoring approaches. Dr. Okey is well-known internationally for his broadly collaborative analytical approaches to the synthesis of ecosystem knowledge, such as for his innovative ecosystem modelling approaches, for his work on climate change impacts in marine ecosystems, and for integrating indigenous and Western scientific knowledge. Dr. Okey has published over 80 scientific publications of various types, and has convened many collaborative workshops and symposia as well as some international conferences. He received his Ph.D. in Zoology from the University of British Columbia, his M.S. in Marine Science from Moss Landing Marine Laboratories (California State Universities); and a B.S. in Biology and Environmental Studies at Saint Lawrence University in New York. He has taught courses at Bamfield Marine Sciences Centre and Royal Roads University on subjects including Earth Systems Science, Climate Change, and Land Use and Environmental Planning, and Coastal Biodiversity and Conservation.